Yamaha promotes the P45 from their P-Series as their most affordable digital piano. It got 88-keys graded hammer standard keyboard (GHS), you can change touch sensitivity, it got different sounds and can be duo split which we will talk later about. The price tag, which lies in the middle-class section of digital pianos (Around 400 Dollar), is a welcome change for many students and it’s hard to undercut this price without sacrificing build quality or features. 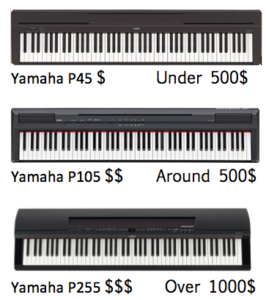 Compared to other pianos from the P-Series the Yamaha P45 is the cheapest. The other two, especially the P225 has got many more features like accompaniment and a different rhythm, but you as a reader need to consider if you need this. This “Yamaha P45 Review” focus on the features, sound, and price/performance ratio of the Yamaha P45. The piano is mainly focused on students who want to have a good 88-key GHS digital piano without some unnecessarily features. Instead, the features focus on teaching, the keyboard can, for example, be divided into two equal sections to play along with your teacher or friends. 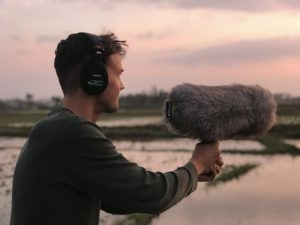 – Which features/sounds do I need? – Do I practice classical or rhythmic music? – Would a different design fit better in my practice environment? – Is it important to have a portable piano? But let’s start with our Review of the Yamaha P45 and its features, sound and more. The Yamaha P45 is a simple Piano. It got three little switches/regulators but nothing else at the top. The rest of the P45 is pure black with the “Yamaha” logo in the mid. In some or another way they need to show who produced it, a bit attention-grabbing but fine with me. You can get the Piano with an adjustable X-stand or with a matching classical black piano stand. Or you use any other stand you buy online or made yourself. “Unlimited possibilities“. But that isn’t something special. The Yamaha P45 is normal, simple and not a lot more. If you want something more creative or something with a personality you should check out the Yamaha Arius YDP-143, or anything from Yamaha’s ARIUS series. The dimensions and weight of the Yamaha P45 is (W x H x D): 1326 x 154 x 295 mm and about 11 kg. A compact piano like the lineup reveals (P-series, Portable Series). Therefore it’s perfect for pianists who often need to take their instrument with them. This Piano is from Yamaha, is the first thing I thought when I started this Yamaha P45 Review. That does mean a lot. When we talk about Yamaha and sound, one is clear. The sound is going to be nice, clear, and it fits the price your paying. The Yamaha P45 is no exclusion to this phenomenon. It has good sound, which has a nice depth in it, and sounds clear as it should. You get a clear sound without much ambient noise. Like this guy tries to only get ambient noise. Nothing more to mention other than it’s 10 good piano sounds and demo songs. The most important ones are the 2 piano sounds. One nice and clear, and one “funny”. A bit dissonant but in a “Jazzy” way. Hear for yourself on the Thomann UK website. (Thoman UK, is a British/German music store). If you split the piano in Duo mode. You get two identical parts of the piano with the same notes. Together with the GHS (Graded Hammer Keys), it has anything a student needs. Practice and recording possibilities, a way to practice with your teacher, and a cheap price tag. The price of the Yamaha is probably your favourite section of the Yamaha P45 Review, and why? Because it only cost around 400 USD (At the time being, Januar 2017). That is really cheap considered the 88-Keys, Graded Hammer standard keys, and different features which can be helpful when you want to record something or want to practice in an efficient way. The USB-to-host connection lets you, for example, use different Piano sounds when you plug it into your PC. Another thing which has to be considered is the possibility to use Piano software which helps you practice. We wrote an article about the teaching software “Synthesia” where you can learn more about it and whether or not to use it. 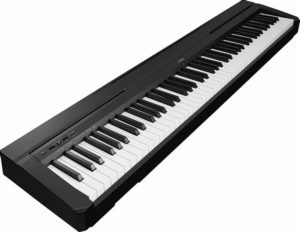 Compared to other pianos from Yamaha, the P45 as reviewed in Januar 2018 has a cheap price and is placed in the low/middle class. It has a great price/performance ratio, and it’s hard to find a piano with 88-keys, and GHS for a lower price, without sacrificing build quality or the great features of the P45. Though… I would consider checking out Yamaha’s ARIUS lineup if you want something a bit more stylish with more modern day features like more voices, reverb and Yamahas Sound optimization engine which makes practising with headphones a lot more bearable (Around 200 USD more than the P45). Read about Yamaha’s Arius YDP-143 here. There is a reason why the Yamaha P45 is on Amazon Top best selling digital pianos. It has good sound, overall decent build quality and some helpful features which piano students will benefit from. Would I recommend this digital piano? Yes, clearly. It is a good digital piano nothing worth discussing if you want a decent piano on a small budget you can not go wrong with the Yamaha P45 from their P-series (Portable Series). 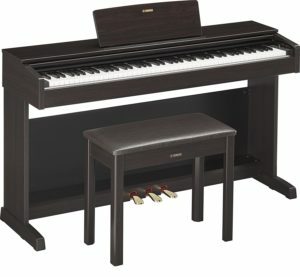 If you want something which has characteristic and a still simple but also classical look to it, I would check out the Yamaha YDP-143 on Pianopanel.com or any other piano from Yamahas ARIUS lineup. Thank you for reading this article. If you want to leave a comment and give feedback about this article, feel free to do. To end this Yamaha P45 review it gets 7 out of 10 pianos. And as always stay Classical.